One of the accomplishments, we at Waldorf Ford, are most proud of, is that for the sixth year in a row, we are on track to win the Ford Triple Crown. The final results will be announced in the near future. Now, you might think “so what”. You shouldn’t. This means a lot for you as our loyal customer – or you as a potential customer. You see, the Triple Crown is awarded to 25 or less Ford and Lincoln dealers nationally every year. It requires that the dealer be in the top 100 dealers in the nation in sales volume, that the dealer win the President’s Award for excellent customer service and that they are in the top in the nation in parts and service sales or Extended Service Plan sales. Waldorf Ford makes it into the top 100 dealers in sales (and many times in the top 50) because we sell a lot of vehicles. This gives us a bigger allocation of vehicles and ultimately a bigger selection of new vehicles for you to choose from when you are ready to purchase. Selling a lot of new vehicles also means that we have a bigger selection of preowned vehicles to choose from because of trade-ins. The next part though is where we are different from other volume dealers. We win the President’s Award. The President’s Award was developed in 1998. Dealers become eligible through survey responses from customers related to their service, satisfaction and overall dealership experience. If we don’t do a good job taking care of you before, during and after the sale, then our scores reflect that. We have currently won the President’s Award six years in a row and 11 times in the last 15 years. 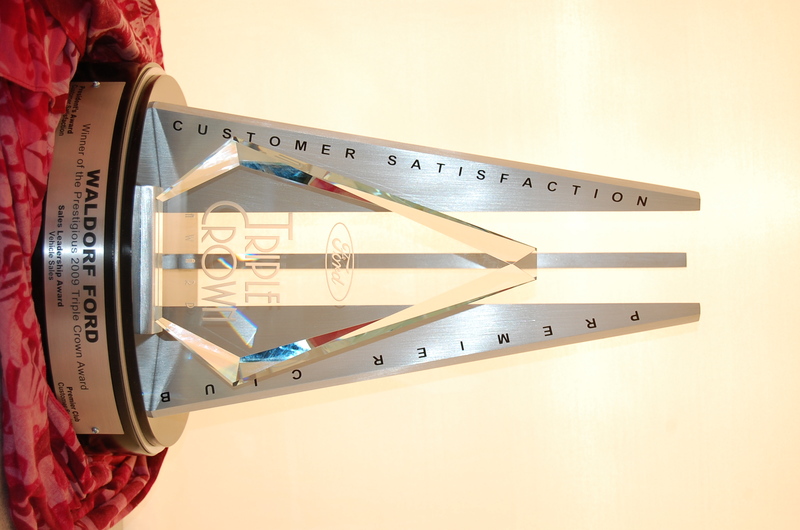 The final qualifier for the Triple Crown Award is to be in the top in the nation in parts and service sales or Extended Service Plan sales. Perennially we are one of the top dealers in the country in Extended Service Plan sales. We want to provide our customers the peace of mind that an extended service plan provides. When your new car’s factory warranty expires, or if you purchased a preowned vehicle, those unexpected repairs can cost you sometimes thousands of dollars. An extended service plan will cost you less and you can pay for it over time if you finance it with the car. Now that we have gone through the details of the Triple Crown Award, want to know something about Waldorf Ford that you didn’t know? Waldorf Ford is the ONLY dealer in our region to ever win the Triple Crown Award from Ford. That’s right the ONLY ONE! It just proves that we are the only dealer in the region that has a large inventory of new Ford vehicles to choose from, that takes care of their customers before, during and after the sale and that cares about the peace of mind of their customers. You would have to drive to Boston or to Charlotte NC to find another dealer that is proven to provide the same service. Next time you are looking to buy a new Ford, or to have your current Ford vehicle serviced, do you think Waldorf Ford will be on your list? We hope so! Waldorf Ford is located on Route 301 north in Waldorf, Maryland. Just 15 minutes south of Washington DC.